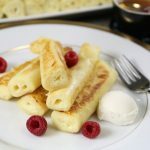 These fluffy cottage cheese filled crepes or so called “Nalisniki” are a new favorite in my recipe book! I have been making my moms nalisniki for some time now but when I tried these crepes at a ladies house from our church, I couldn’t get over how fluffy and delicious they were! I ended up asking her for the recipe and am so glad I did because I think these may just be my new favorite nalisniki recipe! This recipe calls for much less eggs than my moms recipe plus you can use cottage cheese instead of farmer’s cheese which is a nice variation as farmers cheese isn’t always the cheaper alternative. My sister in law commented that “these melt in your mouth”! I don’t think I can explain any better how really fluffy these turn out to be! I hope these may become a favorite like it is ours! Beat the eggs, sugar and salt. Add 2 cups of milk and mix over low speed gradually adding in the flour and cornstarch. Once batter is thick and creamy, add in the remaining milk. Mix in the oil and beat until well combined. 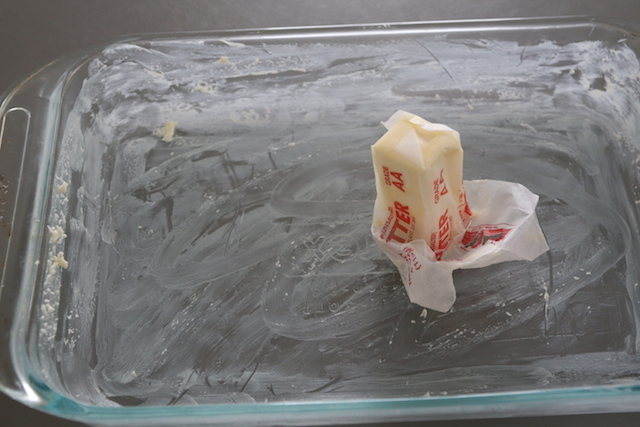 Batter should be smooth and silky. 2. Heat a medium sized non-stick skillet (about 9″ diameter) over low heat. Lightly grease and ladle about 1/3 cup of batter onto the preheated skillet, quickly swirling the pan from side to side to evenly coat the bottom of the pan. 3. Heat crepe through until edges get slightly crispy. Then flip and heat the other side. 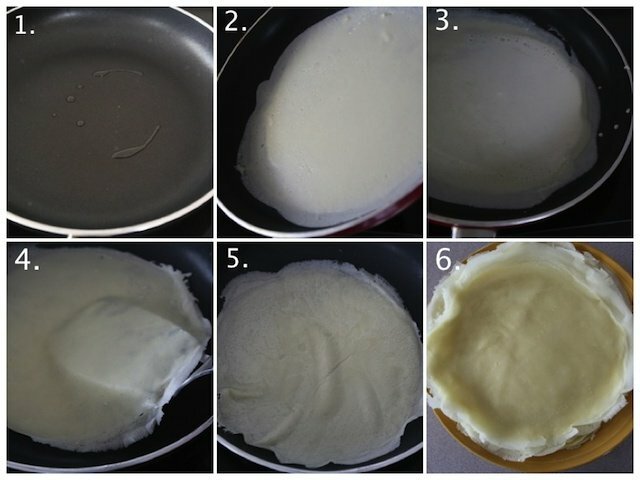 Remove and repeat process, stacking crepes onto a plate. Drain and throughly wash the cottage cheese in a strainer, squeezing out all the liquid; set aside. 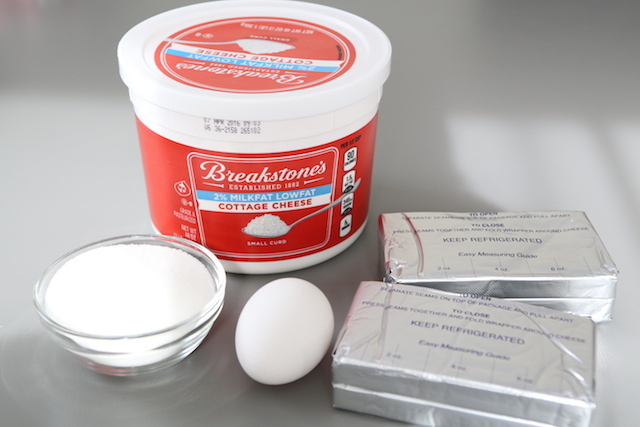 Place cottage cheese into a medium sized bowl and add the cream cheese, egg and sugar. Mix all ingredients thoroughly with a mixer until creamy. Preheat the oven to 350 degrees F. Grease a 13″ by 9″ baking dish and set aside. 2. 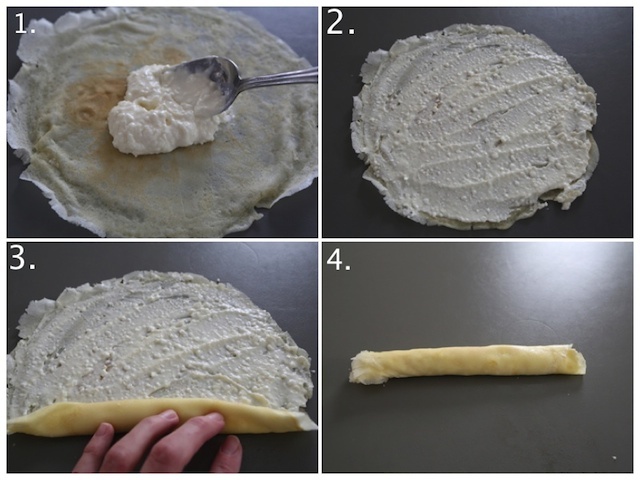 Place crepe onto a working surface and spread 2 tbsp of the cheese mixture evenly over each crepe. 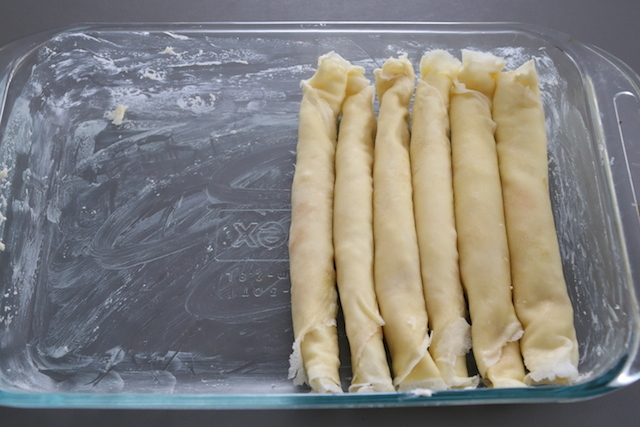 Starting from the bottom half of the crepe, roll crepe upwards and place onto the prepared baking dish. 3. Once crepes have covered the bottom of the baking dish, place 2 tbsp of butter pieces over the tops and repeat stacking likewise. 4. 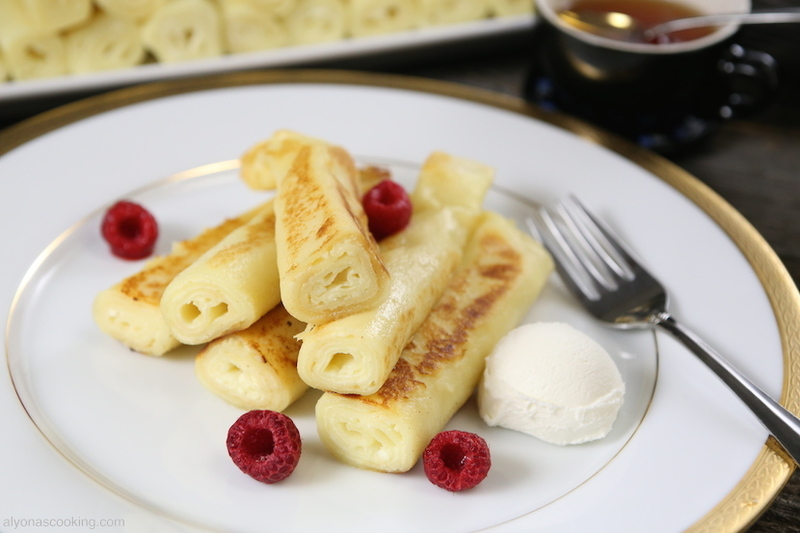 Cover stacked and buttered crepes with aluminum foil and bake in the preheated oven for 25 minutes. Serve warm out off the oven or fry in a buttered skillet like I did this time around…. TO MAKE CREPES: Beat the eggs, sugar and salt. 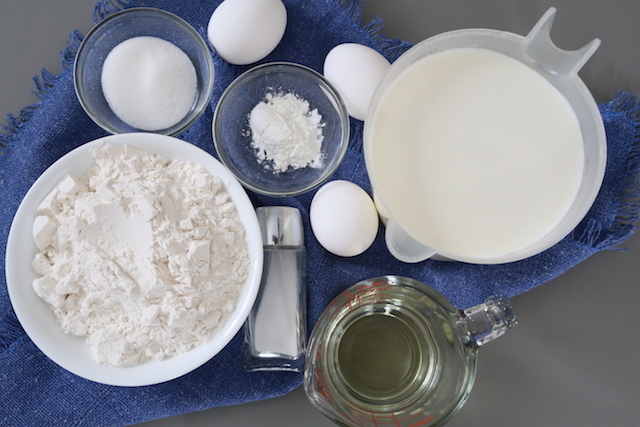 Add 2 cups of milk and mix over low speed gradually adding in the flour and cornstarch. Once batter is thick and creamy, add in the remaining milk. Mix in the oil and beat until well combined. 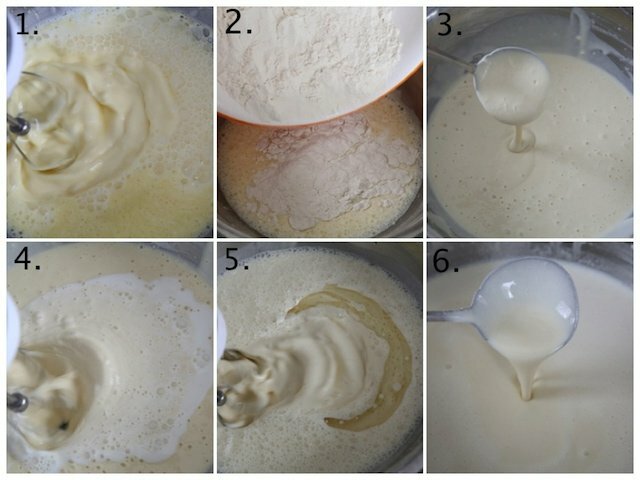 Batter should be smooth and silky. Heat a medium sized non-stick skillet (about 9" diameter) over low heat. Lightly grease and ladle about 1/3 cup of batter onto the preheated skillet, quickly swirling the pan from side to side to evenly coat the bottom of the pan. Heat crepe through until edges get slightly crispy. Then flip and heat the other side. Remove and repeat process, stacking crepes onto a plate. 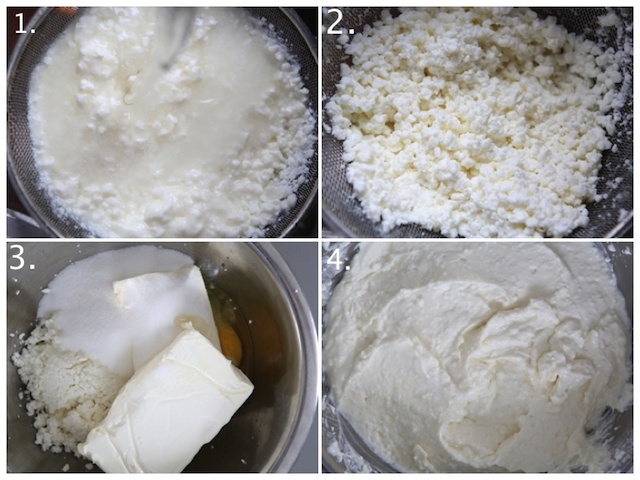 TO MAKE FILLING: Drain and throughly wash the cottage cheese in a strainer, squeezing out all the liquid; set aside. TO ASSEMBLE CREPES: Preheat the oven to 350 degrees F. Grease a 13" by 9" baking dish and set aside. Place crepe onto a working surface and spread 2 tbsp of the cheese mixture evenly over each crepe. 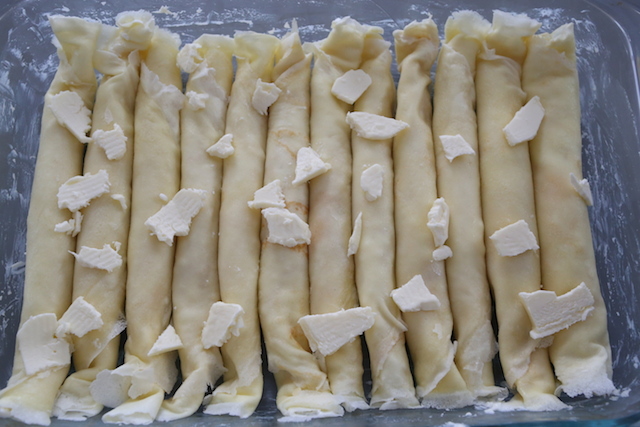 Starting from the bottom half of the crepe, roll crepe upwards and place onto the prepared baking dish. 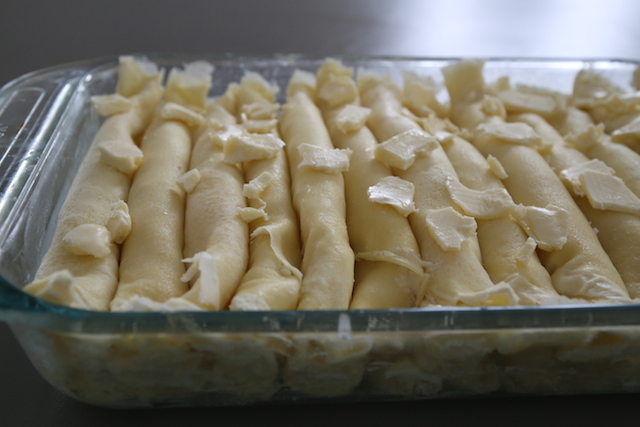 Once crepes have covered the bottom of the baking dish, place 2 tbsp of butter pieces over the tops and repeat stacking likewise. Cover stacked and buttered crepes with aluminum foil and bake in the preheated oven for 25 minutes. How much nalisniki come up? It should make around 26 rolled crepes. 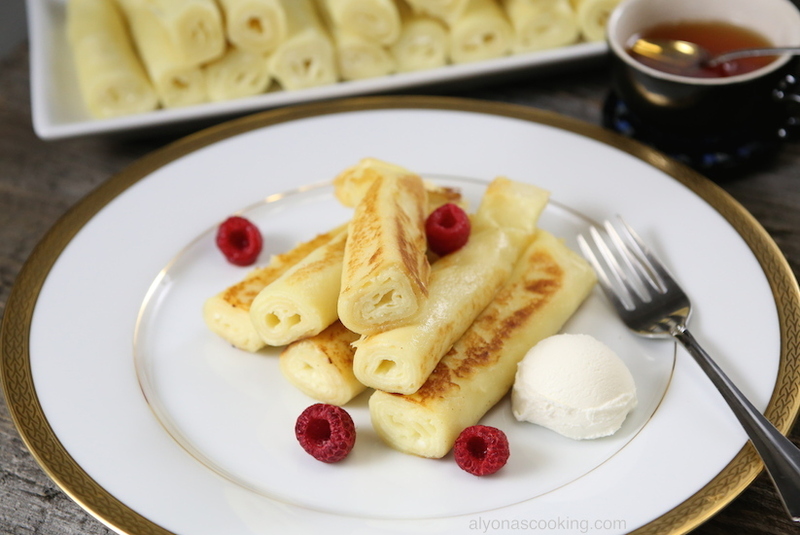 Alyona, This is absolutely the best tasting thin crepe/nalisniki recipe!!!!! I have tried a lot of different pancakes and these ones are absolutely delicious and will be my go-to recipe. I had no problem with flipping, sometimes heating pan really well and letting batter stand for 20-30 min. will help those who are experiencing problems with flipping. Thank you so much for pouring your heart into your blog Alyona! I have tried many of your recipes and they are delicious! Thank you again and again!!!! Tanya, Glory be all to God! Thank you for the awesome feedback! Hi Alyona! I’m using your recipe for the nalisniki. I’m not sure why I can’t flip them at all. They rip right the way. What can cause that??? Are you using a non-stick (black coated frying pan)? I lightly grease, literately a small drizzle on each nalisnik I fry. Be sure to wait until the edges crisp up, you may be flipping them too soon. And make sure there cooking over low heat. Hope these tips help.